Indonesia's Joko Widodo was on track to be re-elected as president of the world's third-biggest democracy Wednesday with pollsters giving him a wide lead over rival Prabowo Subianto, an ex-general. 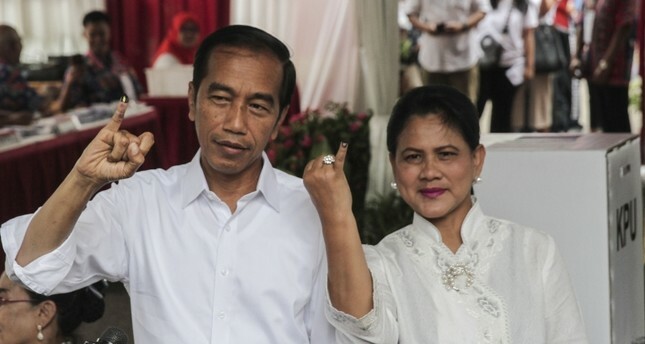 Based on data collected at polling stations, Saiful Mujani Research Centre, Indo Barometer and Indikator Politik Indonesia said Widodo was holding a strong lead, although official results are not due until next month. Saiful Mujani Research Centre said its "quickcount" measure put Widodo at 55.34% against his rival's 44.66%, Indo Barometer said the vote was at 55.36% to 44.64% in Widodo's favor, while Indikator Politik Indonesia put the race at 55.97% to 44.03%. About 193 million people are eligible to vote in polls that will decide who leads the world's most populous Muslim-majority nation and third-largest democracy after India and the U.S. The presidential race is set to be a rematch between incumbent President "Jokowi" Widodo, 57, from the Indonesian Democratic Party-Struggle (PDI-P) and Subianto, 67, from the Great Indonesia Movement Party (Gerindra). Citizens will also elect members of the House of Representatives, Regional Representative Council and provincial and municipal councils. Titi Anggraini, executive director of election watchdog the Association for Elections and Democracy (Perludem), said that previously, legislative elections were held first in April, followed by elections for president and vice president in July. This time, however, voters coming to polling stations received five ballots at once: gray ballots for president and vice president, yellow ballots for the House of Representatives, red for the Regional Representative Council, blue for the Provincial Legislative Council and green for regency/city-level councils. "It is not excessive to say that the 2019 elections are very monumental and historic elections for Indonesia," Titi told Anadolu Agency. She said they are monumental because it will be a very large-scale but also historic election as this was something that had never occurred before in the course of Indonesia's electoral democracy. "Of course, all parties want to be a part of this monumental and historic event," she added. Known for his business in the furnishings sector, Widodo is from the Solo region on the island of Java. Widodo's vice presidential candidate and one of the country's leading religious leaders, 76-year-old Ma'ruf Amin, was the chairman of the country's top clerical body, the Indonesian Ulema Council (MUI). Subianto, on the other hand, is a member of an elite family in the natural resources business. He used to be a general in the Indonesian Special Forces before entering politics in 2004 in the Golkar Party. He later founded Gerindra. Both candidates first ran against each other in the 2014 presidential election, when Subianto lost by 6 percentage points to Widodo. Opinion polls have consistently given a large lead of as much as 20 percentage points to Widodo, though analysts say the race is likely tighter.